Exercise is recommended for all healthy pregnant women, taking into account the overall condition of the future mother and, if necessary, consultation with physician. 2. Starting position - 2A. Ball pressed against the wall with back. Roll it on a wall and do as large circle as possible - 2B, 2C, 2D. Breathe smoothly and regularly. Repeat 3 times on each side. 3. 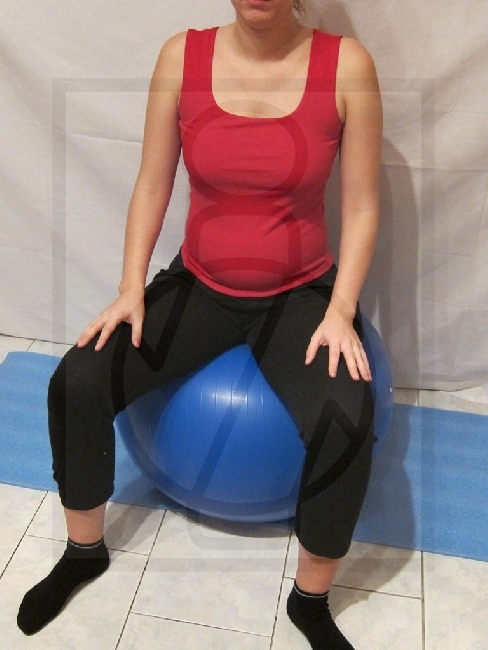 Sitting on the ball, stretch your back, feet apart on shoulder width and stand firmly on the mat with your feet - 3A. Shrugs hands in elbows and put them together with palms - 3B. Inhale and and raise your hands up, above your head with exhale- 3C, subsequently return hands to the starting position - 3D. Repeat 5 times. 4. 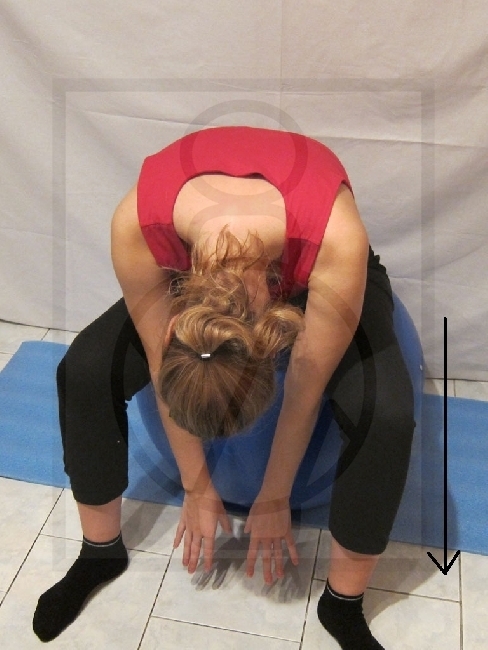 Sitting on the ball, stretch your back, feet apart on shoulder width and stand firmly on the mat with your feet - 4A. 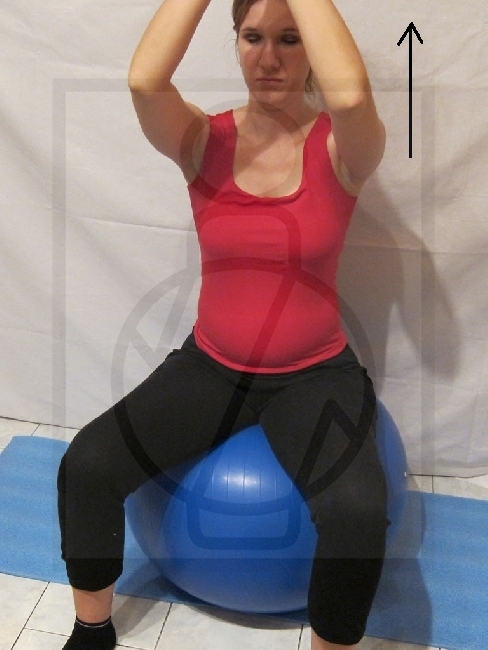 palms on thighs, lean head - 4B, hands pushing towards mat, gradually bend your back and relieving spondyl after spondyl - 4C. The deep bend - 4D endure for a few seconds, the entire spine is relaxed, breathe. Slowly return in the opposite sequence of movements to the upright position - 4A. Repeat three times. 6. Kneel down, sideways to the ball, shrug leg in a hip joint and put it on the ball where you shrug knee to 90 ° - 6A. 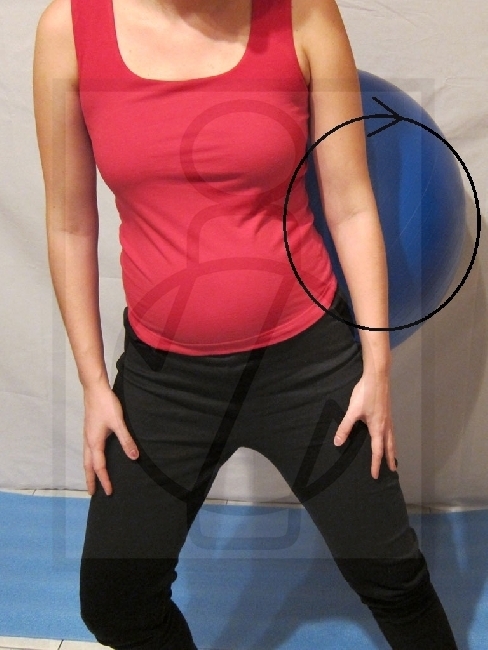 Move ball backwards with knee- 6B roll it to the side - 6C, roll it to the body - 6D. Slowly roll the ball in circle, breathe regularly, repeat 6 times. Switch legs and repeat the exercise on the opposite side of the body.